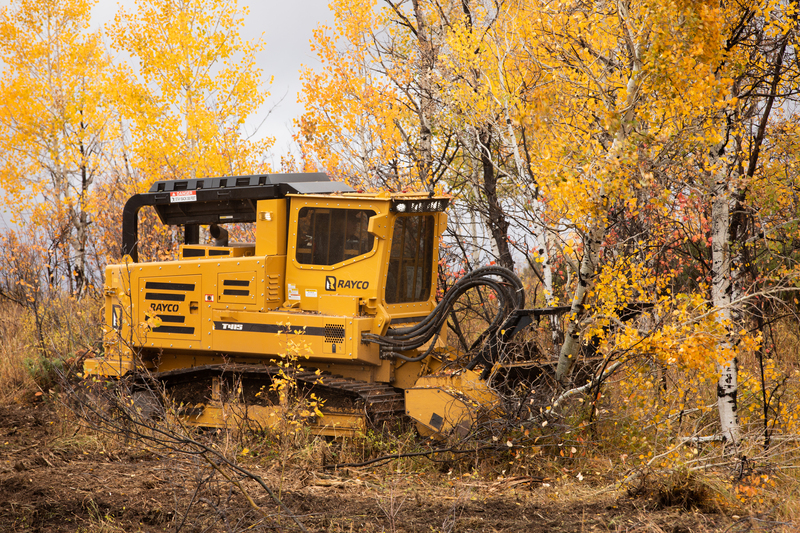 “The T415 Forestry Machine is designed for large-scale land-clearing contractors,” said J.R. Bowling, Rayco Manufacturing mulcher specialist. “It’s a lot of cutting power in a very nimble package.”Powered by a 415-HP (310-kW) CAT C9.3B Diesel Tier 4 Final engine, the T415 boasts a closed-loop hydrostatic system to power the mulcher or cutter head, sending 140 gallons per minute (530 L/min) to the attachment’s drive motor(s). The hydraulic output is power-optimized to match the engine’s power curve, keeping the mulcher/stumper RPM constant even under load for a finer mulched product with fewer passes. As the engine RPM pulls down under load, pump displacement increases to maintain the 140 gpm flow. The operator feels more power at the cutter head over a broader engine RPM band. For mowing/mulching applications, the Predator mulcher head has a 91.25″ (232 cm) cutting width and is powered by a pair of variable displacement drive motors. The Predator mulcher head is equipped with 49 single-bolt teeth, including end teeth with extra carbide to power through anything its way. The mulching head also has a synchronous drive belt for low maintenance and long wear life and slotted mounting lugs to follow terrain with minimal machine stress. A manually adjustable tree catcher and hydraulic debris flap is standard equipment. The Hydra Stumper head muscles through stumps with its 48″ (122 cm) diameter x 3″ (7.6 cm) thick cutter wheel equipped with 56 Monster Tooth™ cutter tools. The cutting range is 9′ (2.74 m) wide, 8’10” (2.69) high and 46″ (116.84 cm) deep.